Make sure your dog is visible on those night time walks. This light is just as strong and durable as the Convert Harness itself. 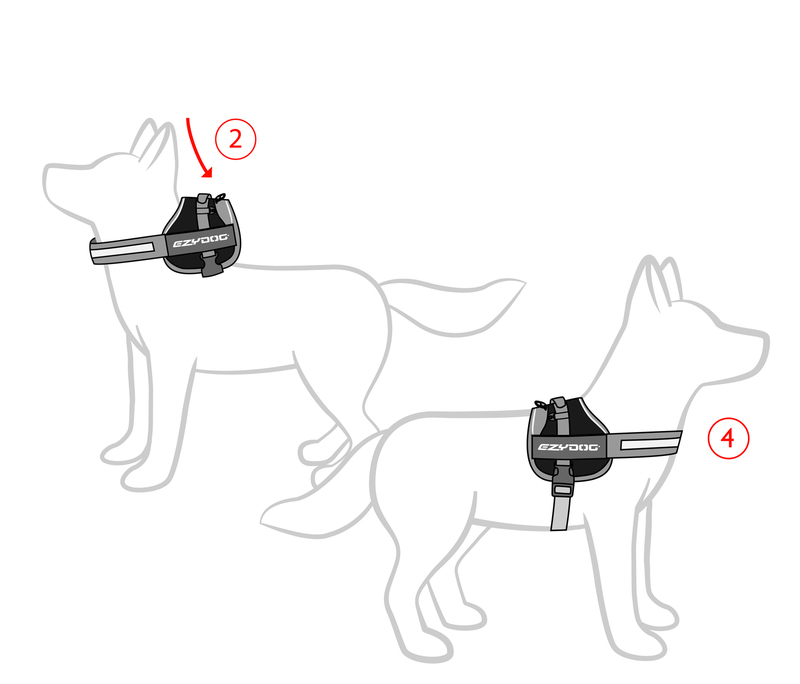 "This harness is designed to carry weight so it doesn't really have much of a use for very small dogs where there are no attachable saddle bags for it. Just another choice in design with the harness being back rather than chest orientated. We use this harness for securing in the car so it works okay but the cheaper, lighter harnesses are a better choice if you do not need the carrying capacity of saddle bags. It looks very smart and well made but not the best choice for a toy breed of dog. On a larger dog I could see better use. " "Second dog, second harness! Could not resist from getting second one - they are the best investment! So easy to catch and grab your dogs now! Even to carry them hehe))) and if you put those awesome signs like "in training/naughty/drama queen/police"..then you will make everyone's day!))))) Super solid quality and look)) well, like every other Ezydog product, I guess)))"
"I purchased the Ezydog harness for my husky Navaho and he looks so smart in it and he loves it. My hubby also loves it as he is not pulling as much. We always walked our husky with a racing harness on, big mistake but have now found the answer. Cannot wait to purchase another one for our other husky Mia and the shock coupler"
"I'm really thrilled with this harness and my dog seems to be too. It's so easy to put on and I love the design. It was recommended to me by my daughter who has one for each of her dogs. I go camping a bit and dogs need to be on a leash at all times but everytime someone walks by he gets so excited and in trying to get to them keeps choking himself or just about breaks his little neck. This will be so much more comfortable for him and enable me to relax." "easy to put on. Very well made. "Glad I finally bought this for my dog. It fits her well and it's a very well made." would recommenced to anyone "
"This harness is the second we have purchased, one for our five Y/O German Sheppard and now one for our One Y/O Miniature Poodle. Not only are they well made, look great, fit well but are practical and give great control to the handler. Would recommend these harnesses as well all other Ezydog products. "My 6 months old Staffy looks and behaves like a handsome pup in training wearing his harness. His behavior has improved 100% and the harness is beautifully made. Will recommend this harness to all my dog-owner friends and will NEVER buy another harness brand." "Linda - Paws & Claws Dog Walking Coffs Harbour"
Only Harness that should be on the market! "This is simply the best harness on the market. I can not rate it any higher.. I have one in every size and use them everyday. As a dog walker they get absolutely hammered, always in salt water, being adjusted all the time to suit different dogs. Will never let you down. And I reckon that the dogs feel pretty special when wearing it. They trot along as proud as punch."